Dennis Kucinich along with running mate Tara Samples call for Ohio cities to lobby for assult weapon bans in Cleveland on Monday. 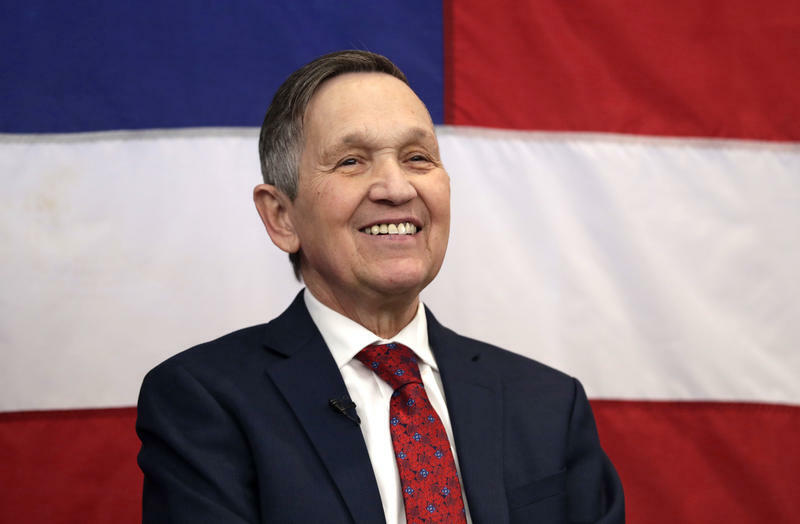 Gubernatorial hopeful Dennis Kucinich is calling for cities across Ohio to lobby state lawmakers to ban assault rifles. The former Ohio congressman says public opinion about high-powered weapons is at a tipping point. 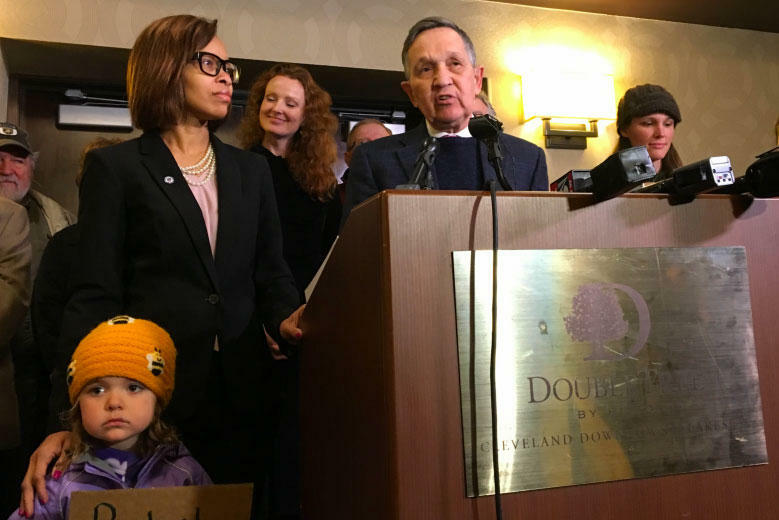 On Monday, supporters from across Ohio crowded into a hotel meeting room in downtown Cleveland, waving signs and chanting their support for Kucinich's plan to lobby the state legislature for a change in Ohio's gun laws. Kucinich is calling for city councils across the state to pass resolutions demanding a ban on assault-style weapons with high-capacity magazines. “Without regard to who's in the legislature, without regard as to who controls the legislature, banning assault weapons will be a major issue in the 2018 election, whether it's a Democrat or a Republican,” he said. But, Doug Deekan of the gun rights group Ohioans for Concealed Carry says Kucinich is playing his own political game. Kucinich followed the rally with a public meeting to plan next steps in the assault weapons campaign. A 2006 state law bans Ohio cities from passing gun laws that go beyond state regulations. The Ohio Supreme Court upheld that law in 2010. Semiautomatic assault-style rifles have been used in several mass shootings, including the recent mass shooting that took place in Orlando and killed 49 people. They also remain a popular firearm for many gun enthusiasts. This hour we'll discuss the history of these weapons and their regulations. When Dennis Kucinich failed to win reelection to Congress in 2012, he made a relatively rare career choice for a Democrat: He went to work for Fox News.